I was born in Southern California and spent my first nine years living in a little town called Eagle Rock. We had guava trees in the front yard and towering palm trees in the grassy strip between the sidewalk and the curb. Nearby, my grandmother grew Meyer lemons and had a four foot high hedge of rosemary. Of course, in those days, I had no appreciation for absurd bounty that grew all around me. I longed for winter and days of heavy, deep snow. These days, I’m quite contentedly tucked into a life in Philadelphia. We get more than enough snow to satisfy my longings, but in true grass-in-always-greener fashion, I miss the warm winters of Los Angeles and all that gorgeous citrus. While I can’t beam all that sun my way, I can still get the citrus. I buy box upon box of those easy to peel clementines. I order Meyer lemons direct from Florida. And I make jars of Orange Cardamom Curd as an occasional treat. 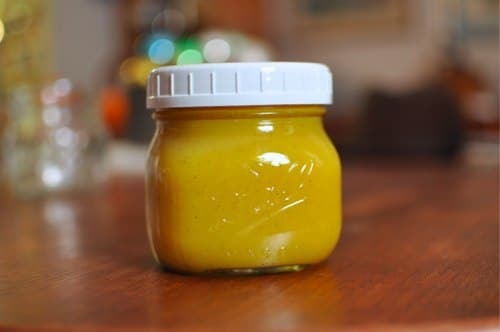 If you’ve never had homemade citrus curd, it is paradise in a jar. Creamy, sweet and just a bit tangy, it’s a dream stirred into Greek yogurt or heaped atop a freshly baked scone. If you need a quick dinner party, serve it with store bought shortbread cookies. I promise, your guests will swoon. The yield should be right around a pint. It keeps up to 14 days in the refrigerator, but can also be frozen in smaller containers, should you not want to eat it all in just two weeks. In a small bowl, stir together the orange zest, sugar and cardamom. Remove the top half of the double boiler and let it cool briefly. Once it has returned to room temperature, add the egg yolks and whole eggs and whisk them together. When they are well beaten, add the sugar mixture and orange juice. Stir to combine. Place the top of the double boiler on the steaming bottom pan and add the butter. 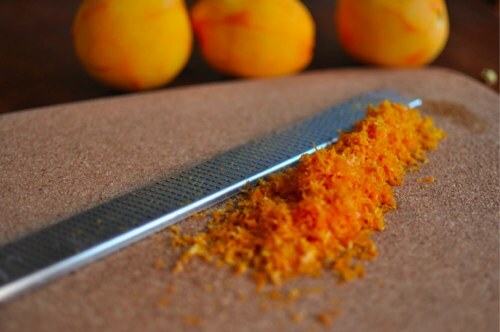 Switch to a rubber or silicone spatula and stir continually as the orange curd begins to cook. Using an immersion thermometer, monitor the temperature of the curd while you stir. As it approaches 190 - 200°F, it should start to thicken. One sign of doneness is that it will coat the back of your spoon without running or dripping. If it is slow to thicken but is approaching 210°F, remove the top portion of the double boiler and let it cool for a moment before returning to the heat for an additional minute or two of cooking. It typically takes 6 to 9 minutes for a curd to cook through. How do you use citrus to combat the January blahs? Marissa, where do you order your lemons from exactly? I have a really hard time finding Meyer Lemons (and they are never organic) Would love to know your source. I love Lemon Curd! Leigh, last year I ordered Meyer lemons from the Lemon Ladies. Here’s the link to their site: http://www.lemonladies.com. They’re not a certified organic orchard but they use organic fertilizer and integrated pest management techniques. Their lemons are beautiful. Liking this. Was planning on making some meyer lemon curd but may have to change or add this to the list. Orange and cardamom is such a soothing combination to me for some reason. Yes to citrus in winter (and lemons anytime!) – I just made a grapefruit-meyer lemon pound cake since I couldn’t look at ANYTHING chocolate after the holidays. It works, I promise! Just don’t forget the headspace! I love orange and cardamom – so I’ll be dreaming of this curd until I make it! Okay, just finished up a batch – organic navel oranges were on sale for a buck a pound. The world wanted me to make curd. Very nummery. I did cut back on the cardamom a bit because mine was fresh ground and strong and I didn’t want it to overwhelm. So mine is more cardamom scented orange curd. Still excellent. 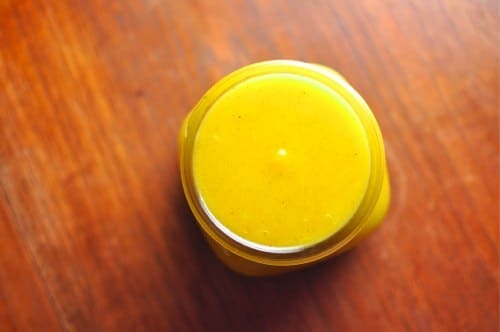 I love the pucker of lemon curd, but this is a lovely condiment as well! Oh, and I have had great results freezing lemon curd. I made lemon curd for the first time last year and absolutely loved it! This looks like a wonderful twist. I can’t wait to make some. I just made this, and it is SUPER good! Thanks for sharing! Beautiful curd and one I will definitely have to try! Hi Marisa: I hope the sun is shining where you are. 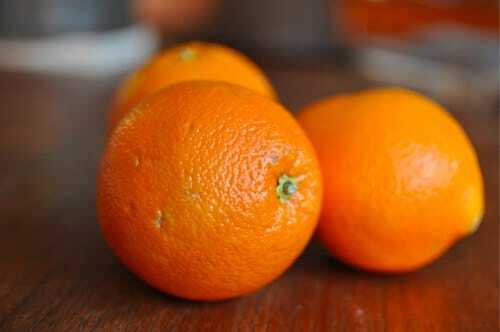 If I was to substitute clementines for the Naval oranges, what would be the ratio? 2 clementines for 1 lg. orange? Or would it be 3? Charlie, you need approximately 1/4 cup of zest and 1/2 cup of juice for this recipe. So just zest and juice until you get to those volumes. Do you think it would be possible to sub earth balance for butter in a curd? Steph, I’ve never done it so I have no ability to tell you how it will turn out. YUMMMMM! I am a sucker for cardamom. I actually have a chest full of lemons and oranges. I was thinking of the usual lemon curd recipe or maybe even cranberry curd but cardamom is my weak spot! This sounds scrumptious. I made this last night. So delicious! thanks for sharing the recipe. I made a batch this morning. It was so hard not to eat it all straight from the jar! WOW! I have been pretty sure that I need to attempt a citrus curd of some variety. It already sounded delicious, but you mentioned stirring it into yogurt and totally sealed the deal. I have to try it now! This is not a shelf stable recipe. It can only be stored in the refrigerator or freezer. I just attempted to make this curd. I only saw the comment about the juice afterward though. I think my recipe had too much juice. I couldn’t get the temp up to 210 and it never thickened much more than maple syrop in the pot. Any ideas to turn this around? I just took it off the stove. You can cool it down a bit and then return it to the stove to cook some more. The primary goal is to keep it from boiling, so as long as you’re able to accomplish that, you can keep cooking it until it thickens. I did cook it for approximately 45 minutes. If the cooling and reheating will work, I’ll try it 😀 I also tripled the recipe, since I had so many oranges, so at this point, its an investment LOL. Thanks! Leanne, the fact that you tripled it is the problem. You can’t triple recipes like this because they depend on a certain amount of evaporation that you can’t get with that much volume in the pot. I’m afraid that this batch may be doomed. I know this post is pretty old but maybe somebody will see this anyway. Help! I made this curd a few days ago, or anyway I tried. I could NOT get the curd up to 210. It took forever to even get to 180 and simply wouldn’t thicken. I ended up with a sticky, gooey, gluey mess that tasted like caramelized sugar but not at all like oranges, and it was an ugly pea soup color. I’ve made curd (including this one!) before and never had that problem. I’m certain I followed the measurements properly. The only difference I can think of is that I was cooking in a friend’s kitchen and substituted a pyrex bowl over a pot of water for a double boiler. Also she was using organic eggs that had smaller than normal yolks. Could that be it? Has this happened to anyone else? What did I do wrong here?